Draft: 2015, Washington Nationals, 2nd rd. Andrew Patrick Stevenson...Graduated from St. Thomas More (LA) High School...Attended Louisiana State University...Was considered one of the top defensive center fielders in the nation and one of the best hitters in one of the best baseball conferences in the country, the Southeastern Conference (SEC)...Was named First-Team All-SEC following the 2015 season...Is married to wife, Michelle. Began the season with Triple-A Syracuse before being recalled on April 17... Went on to enjoy two stints with the Nationals, appearing in a career-high 57 Major League games...Hit safely in seven of 10 Major League starts, hitting .286 (10-for-35)...Set career marks in hits (4), doubles (2), RBI (4) and runs (2) on April 25 at San Francisco...Clubbed his first career home run, a pinch-hit, game tying home run on Aug. 21 vs. Philadelphia (Arano) after being recalled from Triple-A earlier in the day...Appeared in 77 games for Triple-A Syracuse, hitting .235 with 10 doubles, one triple, six home runs, 28 RBI, 31 walks, 12 stolen bases and 40 runs scored. 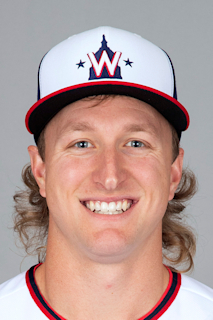 Enjoyed two stints with the Nationals after having his contract initially selected from Triple-A Syracuse on July 23...Made his MLB debut that day at Arizona... Entered the game as a pinch hitter and remained in the game in left field... Recorded his first MLB hit on July 28 vs MIL (Perez)...Appeared in right field (14 G/9 GS), left field (9 G/1 GS) and center field (5 G/2 GS) during his initial MLB season...Made a game-winning diving catch to seal Washington's 3-2 win over the visiting Miami Marlins on Aug. 10 at Nationals Park...Hit .272 with 12 doubles, three triples, two homers, 38 RBI, 11 stolen bases and 52 runs scored in 99 games between Double-A Harrisburg and Triple-A Syracuse. In his first full professional season, hit .276 with 23 doubles, 10 triples, three homers, 34 RBI, 39 stolen bases and 75 runs scored in 133 games between Single-A Potomac and Double-A Harrisburg...Was promoted to Harrisburg on June 27...His 39 stolen bases ranked second among Nationals farmhands...Was named Carolina League Player of the Week on June 26 and a Carolina League mid-season All-Star...Was named the MVP of the California League-Carolina League All-Star Game (3-for-5, 2 3B, 2 RBI, 2 R)...Hit .353 (30-for-85) with four doubles, two triples, two homers, 12 RBI, nine stolen bases and 18 runs scored in 21 games for Glendale of the Arizona Fall League. Reported to short-season Single-A Auburn following the 2015 First-Year Player Draft...Saw action at three levels of Washington's system...Reached base safely in 15 straight games, hitting safely in 14 of the 15, from July 2-24...Hit .397 (23-for-58) with a .429 on-base percentage during that stretch. 8 de abril de 2019 Washington Nationals opcionado LF Andrew Stevenson para Fresno Grizzlies. 21 de agosto de 2018 Washington Nationals llamado LF Andrew Stevenson de Syracuse Chiefs. 1 de junio de 2018 Washington Nationals opcionado LF Andrew Stevenson para Syracuse Chiefs. 17 de abril de 2018 Washington Nationals llamado Andrew Stevenson de Syracuse Chiefs. 24 de marzo de 2018 Washington Nationals opcionado CF Andrew Stevenson para Syracuse Chiefs. 13 de octubre de 2017 Andrew Stevenson estado en la lista cambian a por Washington Nationals. 6 de octubre de 2017 Washington Nationals reasignado CF Andrew Stevenson a las ligas menores. 7 de septiembre de 2017 Washington Nationals llamado CF Andrew Stevenson de Syracuse Chiefs. 28 de agosto de 2017 Washington Nationals opcionado CF Andrew Stevenson para Syracuse Chiefs. 23 de julio de 2017 Washington Nationals seleccionado el contrato de Andrew Stevenson de Syracuse Chiefs. 1 de mayo de 2017 CF Andrew Stevenson asignado a Syracuse Chiefs de Harrisburg Senators. 11 de febrero de 2017 Washington Nationals invitado fuera del roster OF Andrew Stevenson para spring training. 27 de junio de 2016 CF Andrew Stevenson asignado a Harrisburg Senators de Potomac Nationals. 8 de marzo de 2016 OF Andrew Stevenson asignado a Washington Nationals. 6 de septiembre de 2015 Hagerstown Suns activan a OF Andrew Stevenson de la lista temporalmente inactiva. 27 de julio de 2015 OF Andrew Stevenson asignado a Hagerstown Suns de GCL Nationals. 23 de julio de 2015 OF Andrew Stevenson asignado a GCL Nationals de Auburn Doubledays. 26 de junio de 2015 OF Andrew Stevenson asignado a Auburn Doubledays. 25 de junio de 2015 Washington Nationals firmado OF Andrew Stevenson.